This was the year that the regular competitive category of Best Foreign Language film was introduced, instead of only being recognized as a special achievement Honorary Award or as a Best Picture nominee (as in 1938). The nominees were from West Germany, France, Japan, Italy, and Denmark. The first winner in this new category was Federico Fellini's La Strada with Anthony Quinn and a second nomination for Original Screenplay. Its win would help to create an interest in foreign-language films - with subtitles. Another Fellini film, The Nights of Cabiria (1957) would win the Best Foreign Language Film Oscar in the following year. Another possible trend, signaled by the victory of Marty (1955), toward simpler, shorter, intimate dramas, did not occur again in 1956. Instead, there was the splashy emergence of wide-scale, expensive super-epics (colorful dramas, musicals, comedies, and costume pieces) all at least two hours long - mostly to compete with the resurgence of television. This was only the second time in Oscar's long history that the top six prizes (Best Picture, Director, Actor, Actress, Supporting Actor, and Supporting Actress) went to six different films. It also occurred in 1952 and wouldn't occur again until another 49 years later - in 2005! Of the five nominees for Best Picture, only Cecil B. De Mille was not nominated for his film as Best Director. [De Mille's film won only one Oscar, for John Fulton's Special Effects - including the spectacular parting of the Red Sea.] In De Mille's place, King Vidor was nominated for the spectacular historical epic of Tolstoy's novel War and Peace (with three nominations and no wins), starring Henry Fonda and Audrey Hepburn. [This was Vidor's fifth and final Oscar nomination, following earlier nominations for The Crowd (1928), Hallelujah (1929-30), The Champ (1931-2), and The Citadel (1938). Vidor never won an Oscar.] The directing Oscar went to George Stevens for Giant, a film without any other Oscar wins. With 20th Century Fox's and director Anatole Litvak's made-abroad Anastasia (with two nominations and one win - Best Actress), Ingrid Bergman (with her fifth nomination) won her second actress Oscar twelve years after her previous win in 1944. It was her first American film in many years in the role of a Paris derelict saved by three White Russians and trained to pose as the missing, but surviving daughter of last czar of Russia - Czar Nicholas II and Alexandra. It marked a triumphant, vindicating return for Bergman after being informally blacklisted and ostracized for seven years and living in European exile from Hollywood for her 'scandalous' adulterous affair (and illegitimate son) with Italian director Roberto Rossellini. The affair was all-the-more scandalous because of her appearance in wholesome and chaste Oscar-nominated film roles, such as The Bells of St. Mary's (1945) and Joan of Arc (1948). [Bergman made her first appearance at the awards ceremony in April of 1959 to honor 1958's films - she hadn't been at the Oscars since 1949.] The plot of the film, based on the role created on Broadway by Viveca Lindfors, concerned the puzzling fate of Anastasia, the last surviving youngest daughter of the last Russian tsar, the executed Nicholas II of Russia, who has to convince exiles Yul Brynner and Helen Hayes of her identity. Anthony Perkins (with his sole career nomination) for his role as young Quaker Josh Birdwell in his third film Friendly Persuasion, although he later performed one of his greatest (but un-nominated) roles as motel manager Norman Bates in Hitchcock's Psycho (1960). Dorothy Malone (with her sole nomination - and only Oscar win) won the Best Supporting Actress award for her role as alcoholic Robert Stack's sexually provocative, nymphomaniacal, trampy and spoiled rich sister Marylee Hadley - who finds only unrequited love with right-hand man Rock Hudson in Written on the Wind. This year's Honorary Award went to Eddie Cantor "for distinguished service to the film industry," known for musical comedies of the 30s including Whoopee (1930), Palmy Days (1931), The Kid From Spain (1932), Roman Scandals (1933), Kid Millions (1934), and Strike Me Pink (1936). When Albert Lamorisse's French children's film/short story The Red Balloon, aka Le Ballon Rouge made its debut in 1954, it won the prestigious Palme d'Or in the short film category at Cannes. Paradoxically, the 34 minute film also won the Best Writing: Original Screenplay Oscar -- without a single line of dialogue. The charming foreign film was the shortest film ever to win a screenplay award -- under Academy rules, that made it a live action short subject film. Akira Kurosawa's 1954 Japanese classic epic The Seven Samurai received only two nominations in 1956: Best Art Direction and Best Costume Design, without any honors in the Best Picture category. Judy Holliday was un-nominated for her role as Laura Partridge in the comedy The Solid Gold Cadillac. Marilyn Monroe's vulnerable performance as Cherie in Bus Stop (with only one nomination for Don Murray for Best Supporting Actor), one of her best film roles, went unrecognized. Except for its nomination (and win) for Best Song (the only song from a Hitchcock film to win an Oscar, the familiar "Que Sera, Sera" (Whatever Will Be, Will Be)), Hitchcock's remake of his own The Man Who Knew Too Much received no other recognition (such as a nomination for Doris Day or James Stewart). Elizabeth Taylor was overlooked for her role in George Stevens' Best Director-winning Giant. Blacklisted writer Dalton Trumbo, under the pseudonym of Robert Rich, won the Best Writing: Original Story Award (his second and last nomination and sole Oscar win) for The Brave One. [Note: He had already won an Oscar for Roman Holiday (1953) under a different name (Ian McLellan Hunter, who fronted for Trumbo). He was not there to receive his Oscar in 1957, and wasn't presented with his award (with his real name inscribed on the trophy) until May of 1975, almost 20 years later and just before he died (in September of 1976). 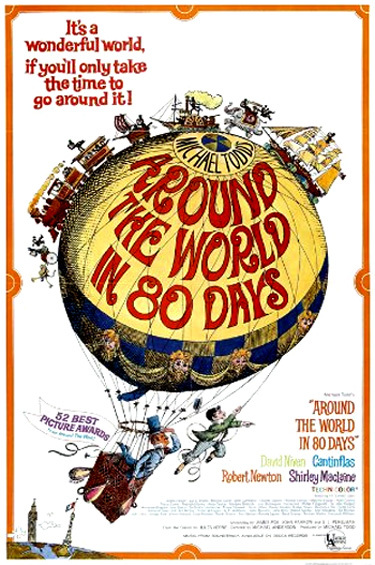 One of the most undeserving awards was Best Adapted Screenplay for the episodic Around the World in 80 Days, shared by three writers: James Poe, John Farrow, and S.J. Perelman. The blacklisted screenwriter for Friendly Persuasion, Michael Wilson, was denied a place on the ballot with a superior script when declared ineligible under 1956 Academy by-laws.